The gas spring is a pneumatic spring that consists of a pressure tube, piston rod with piston and the respective connection elements. The gas spring is filled with a compressed gas, which is generally nitrogen. The piston has a bypass there gas can flow through. The damping force is therefore determined by the size of the bypass opening. All DT® brand gas springs are designed for 100 000 and more load changes and more; this is acknowledged by an endurance test. Furthermore, the springs are maintenance-free. In order to prevent any formation of rust, surface-coated piston rods, which have been put through a 400 hour salt spray test, are used. The working range of all gas springs is at temperatures between -30°C and +80°C. DT® Spare Parts brand engine valves are exposed to very high Gas springs are used in all applications where light and safe movement, a defined sequence of motions or a supporting lifting movement is required. In order to achieve optimum lubrication of the guide and sealing system, the gas springs should be installed with a piston rod pointing downwards in a non-operational state, unless they are intended for installation independent of a position. The gas springs should be protected against tilting, bending forces or lateral forces in order to avoid a negative effect on the service life. 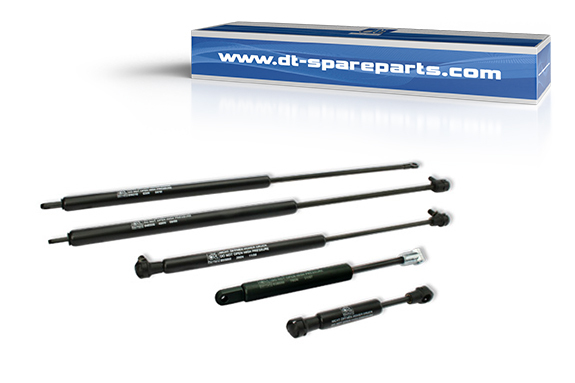 DT® Spare Parts recommends the environmentally-friendly disposal of gas springs. They should be drilled out in order to drain off the compressed nitrogen and the oil contained. The pipe wall thickness is 1.0 - 1.5 mm which guarantees good stability and high protection against bending or lateral forces. Due to the coated surface of the piston rod, a longer service life and better corrosion resistance are achieved. The sealing package between the sleeve and piston rod, which guarantees maintenance of the gas pressure, is designed as a double package. Designed for 100,000 load changes and more. All connection elements and constructions correspond with the reference parts of the vehicle manufacturer.